Dinner at 1900 Park Fare - Pixie & Pirate Destinations *|* Wishes become memories. One dream at a time. My daughter was born loving the Disney princesses; she would even argue that she was born a princess! From the ages of 2 to 5 she practically lived in Disney princess costumes and accessories. 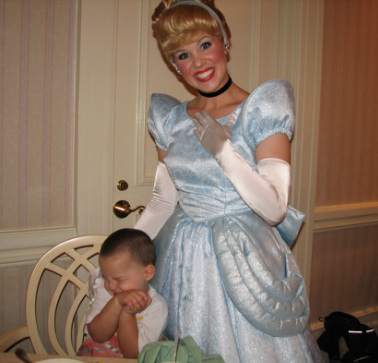 When we took her for her first trip to the Walt Disney World® Resort in 2006 (she was 2), we knew a meal with the princesses was a MUST! 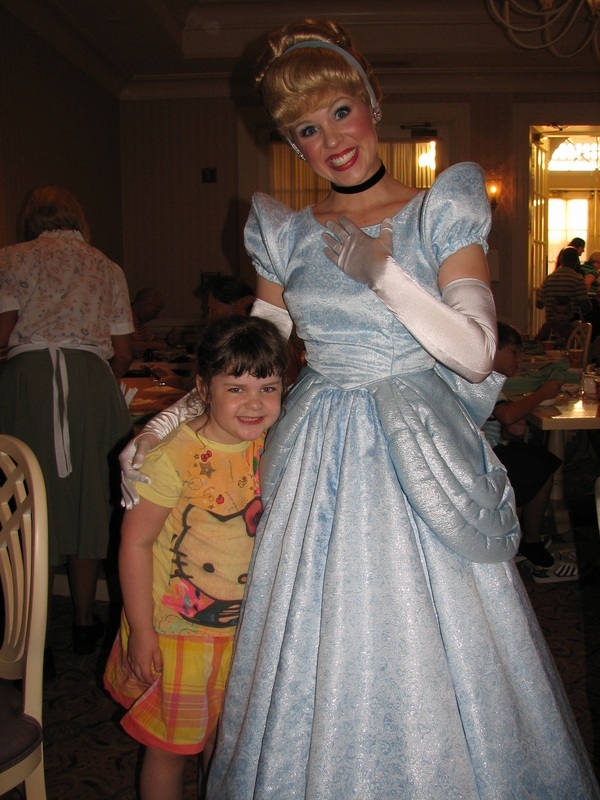 Despite my “best” efforts I wasn’t able to grab one of the coveted reservations at Cinderella’s Royal Table – and truth be told, I didn’t try that hard because I wasn’t sure she would remember it. I wanted to save that special experience for a trip when she was a little older. So, to get our princess fix (most importantly, Cinderella) we decided to go with dinner at 1900 Park Fare. I am so glad we did. We loved it so much that it’s been on our “must eat” list for every trip since – and my husband was bummed when I couldn’t get a reservation there for our trip in 2008! The wide variety of foods at the buffet is more than enough to keep everyone happy. There is everything from soup and salad, to pasta, prime rib, assorted chicken and fish dishes and more side dishes than you will have room for on your plate. You will definitely need to make 2 trips; I’m pretty sure my husband made 3! The children’s corner offers all of the usual meal time favorites – chicken nuggets, mac-n-cheese, pizza, peanut butter and jelly sandwiches and assorted fresh veggies. But don’t fill up on the main course. We could have made a meal out of the dessert offerings alone. There was apple cobbler, bread pudding, assorted cakes and cookies and our absolute favorite SOFT SERVE ICE CREAM, with toppings of course!! Okay, enough about the food……let’s talk about the characters! The usual round up at dinner is Cinderella, Prince Charming, Lady Tremaine, Anastasia and Drizella (but they always say this is subject to change, and some characters may only be in the lobby for photos - before you enter the dining room you have the opportunity to have your picture taken as a family in front of a beautiful castle landscape in the lobby.). On our first visit with my daughter we saw Cinderella, Prince Charming and a few of the girl mice. On our most recent trips we have seen all of the characters I mentioned above, and boy are they characters!! Lady Tremaine and the stepsisters can put on a bit of a show. During our meal there was a loud crash in the kitchen and Lady Tremaine yelled “CINDERELLA!!! !” A fight broke out between the stepsisters and one of them threw herself on the floor in a full fledged temper tantrum that would blow even the most rehearsed toddler right out of the water! _Each of the characters will come to your table to sign autograph books and pose for photos. If you’re up at the buffet, don’t worry – just let your server know and they will send whoever you missed back to your table. We all know that between autographs and pictures the adults don’t usually get to enjoy their meal until all of the characters have made the rounds. 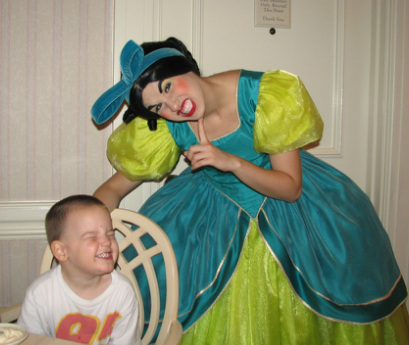 My husband was mid-chew when Lady Tremaine came over to our table and she gave him such a hard time – complete with the evil eye! When we do character meals he’s in charge of the autograph books and I’m in charge of the pictures, except for the ones I want to be in. Dividing the duties helps a lot, and now that our kids are a little older they can handle their own autograph books (and sometimes we skip the books and just go for the pictures)! While nothing can compare to the magic and wonder of meeting Cinderella and her friends and eating INSIDE the castle at Cinderella’s Royal Table, this meal at the Grand Floridian is a great alternative. 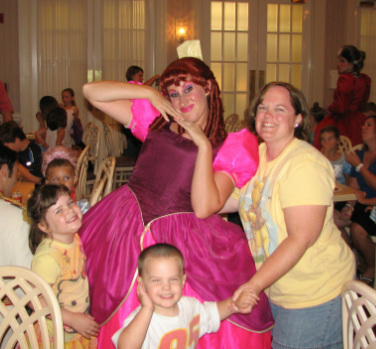 *1900 Park Fare also offers a breakfast buffet with Mary Poppins, Alice and the Mad Hatter. When we there in 2009 we saw Tigger and Pooh too. On our trip in 2010 we enjoyed BOTH meals! Plan your own dinner at 1900 Park Fare in the Grand Floridian - Request your Walt Disney World quote today!